After several months of work, the CREA Network 2.0 update is ready to be launched on February 19. In order to advance in the development of a faster, more efficient, scalable and optimized network, many implementations have been made with a total change of the structure of the blockchain as a result. As a consequence of this structural change, users will have to migrate their CREA to the new blockchain by making a SWAP. This means in practice changing coins from version 1.0 to coins 2.0. This change will be 1:1, so you will get the same amount of coins you had in your wallet of the first version. In this document we will focus on showing the key dates of the SWAP and the steps to follow to convert the CREA. Keep calm, the process will be very simple and fast. Following three simple steps you can start enjoying all the advantages offered by the new CREA Network version and you can start publishing content and earn tokens in the new Creary.net platform that will be launched together with the new blockchain. 1- Store all your CREA in a personal Wallet. 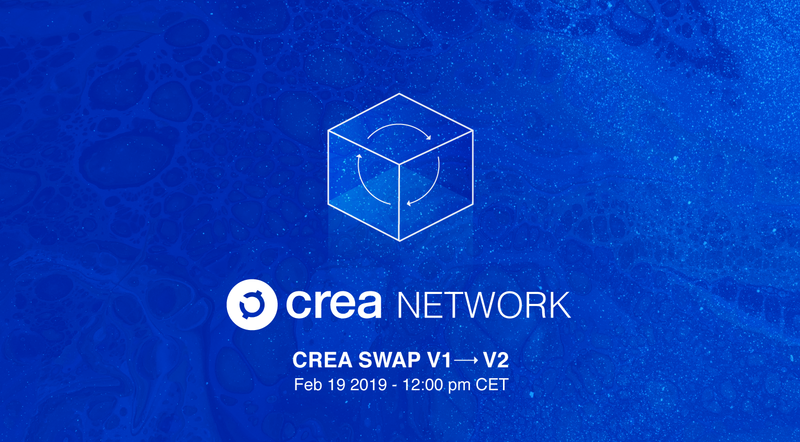 If you have CREA in an exchange or a third party website, we recommend moving it off there before the official date of the Swap (Feb 19 2019 – 12:00pm CET) so that you have full control during the migration process. We recommend using the Wallet QT to store your CREA on your computer. If you don’t have a wallet installed yet, we recommend downloading and installing this Wallet Qt. * Please don’t use the Android app wallet to perform the swap. If you have your funds stored in the Android app, send them to the qt wallet. * The 1.0.9 version of the Creativechain platform also includes a wallet that could be used for the migration process. This snapshot collects the information of all the existing CREA addresses and coins at that moment. Any CREA mined after this time will not be accepted in the new version 2.0. 3.1 After the 1.0 network Snapshot, the new version of the CREA 2.0 network will be launched, giving way to the first genesis block. The process can last a few hours until the entire network is stabilized. 3.2 This moment will be announced publicly on this website and on the social networks of the CREA Network. A guide will be published so that other users can participate as witnesses of the new consensus protocol (DPOS) of the network. To convert your CREA 1.0 to CREA 2.0 follow the steps that are detailed below. – A wallet.dat file with CREA in it (either in the QT wallet or in the wallet integrated into the Creativechain platform). – A computer with internet connection. Download the CREA SWAP APP to start this process. The app is available for WIN, MAC and LINUX. Run the app on your computer. * It is possible that Windows defender prevents the app from running the first time, in this case click on “more information” and then on the “Run anyway” button. Read this section carefully and in case you agree, accept to continue. Then you must login with a CREA 2.0 user account, this is the @user account where the CREA will be sent. – 1) You can use an account created previously on creary.net. – 2) You can create a new account on creary.net and go back to the CREA SWAP APP to login with the new account created. Please read carefully the steps for the registration process and remember to save backup copies of the master key that is generated. Creary does not save the private keys of any user. In case of loss WE CAN NOT RECOVER THE PASSWORD. * In WIN 7/8 / 8.1 / 10 a Windows Defender firewall pop-up window may appear. In this case you will have to check the two checkboxes corresponding to public networks and private networks. Then click on “Allow Access” to continue. After logging in with a CREA 2.0 account, the app will search for the wallet.dat file. In the case of having the Creativechain app installed on your device, the balance will be shown. You can also directly load the wallet.dat file that you saved as a backup of your Qt wallet using the “Load wallet.dat” button. -Before executing the Swap the app will show you all the addresses associated to that wallet 1.0 and the amount that will be sent to your @user in CREA 2.0. If you had the encrypted wallet.dat you will have to add the password. If you had not encrypted it simply click on the “Accept” button. Remember that once the conversion is done there will be no going back. -Finally you will see the message “Swap Performed!” This means that everything went correctly and your CREA 2.0 are in your @user. *Before doing this process, make sure you do not have your QT wallet or the Creativechain platform running. *In case of showing an error after adding the password and pressing the “Accept” button, it is possible that the password added is incorrect. *If you have CREA distributed in several wallet.dat files, you must repeat this process for each wallet. You can now access your user profile on creary.net and go to the section of your wallet “creary.net/@username/wallet” to check that the CREA amount have been deposited correctly. Now you can start enjoying the platform. Edit your profile and start publishing interesting content for the community. Remember that if you want to have more power in your likes you will have to Energize CREA to CREA Energy (CGY) from your wallet. How much time will I have to migrate my CREA? This process will be open for 6 months. We recommend making the change as soon as possible to start enjoying the benefits of having your coins in the main network of CREA and use them in the creary.net DAPP. The 6 months could be extended in the event that Cryptopia (exchange that keeps CREA funds retained) have not yet opened their website for the owners of CREA to withdraw their coins. Where can I request help for this process? Creaproject.io is the project’s official website. We are not responsible for the information that other users or third party websites can give about this release. In what exchanges can CREA (2.0) be found? New exchanges will be announced as SWAP day approaches. The CREA Network team has already contacted and closed agreements with some exchanges. These exchanges will be announced publicly as they open their markets and when they decide to make it public.